In a remote location within a large national forest sits The Leadership Center. Its goal is to educate, train, and develop a new generation of female leaders by providing English immersion, business seminars, and leadership training. Two years of academics are followed by a year of independent study where each woman can focus on starting a business, completing a teacher practicum, or interning for a nonprofit. About 25 students live at the center, all ranging in ages from 18-29 years. The students come to the center through recommendations of teachers, pastors, priests, community leaders, and government officials. The College learned about the center from its board president, Daniel Moore ’75. He invited the team from Lafayette to the center for a week as part of an Alternative School Break (ASB) program. ASB is a student-led organization advised by Director of the Landis Center Amber Zuber. 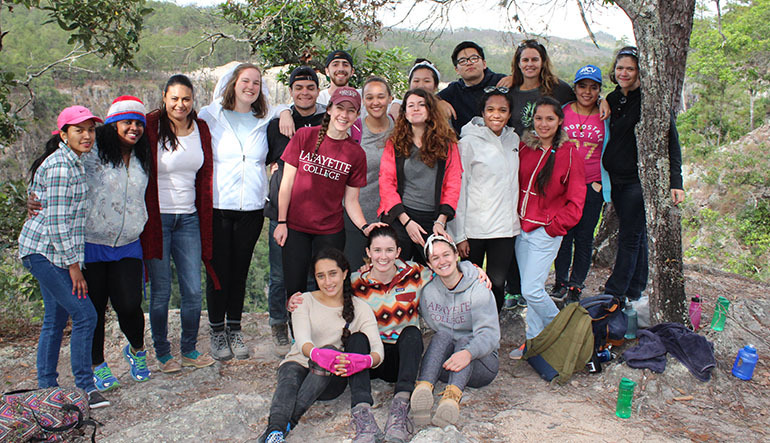 Working with various partners both on and off campus, students plan and implement five domestic service trips and one international service trip over the winter and spring breaks. When the van pulled in from the airport, the Lafayette ASB cohort were welcomed with open arms as if they were family, not strangers. It is the Honduran way, a way that took some adjusting to. The typical day on campus is fairly scheduled: breakfast, devotional, classes, chores, work, and meals. But it was paced, not packed. The ASB team participated in the daily routine. Chores included clearing the land of rocks for what would become an athletic field, hoeing farmland for planting, and picking coffee beans. The school is self-sustaining—the sale of coffee beans and operation of a small store help provide income and opportunities for students to learn business skills. 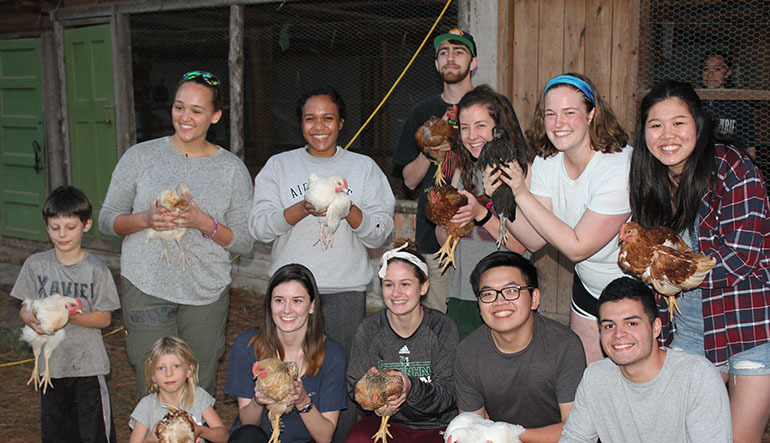 When classes were in session, the team did a few other tasks like building a chicken coop and updating the library, but the group also used the time to learn to slow down and relax. To prepare for the trip, all ASB teams read about social issues. Honduran women endure much. Domestic abuse was legal in the country until 1997. Many families have absent fathers. As a result, young women lack access to secondary school because of pressures placed on them by family members to help support their daily needs. More generally, the economic benefits to this work are substantial. According to the center, women with one extra year of education increase their wages by 10-20 percent. Women with higher levels of education are less likely to get married and pregnant at an early age. Empowered women raise economic productivity and increase the likelihood of reinvesting income into children’s education and future. “Just talking with the students and acting as sources of information was huge,” Weng says. “One of our goals was to demonstrate a culture of reading,” says Librarian Ana Ramirez Luhrs. “So it was natural for me to work in the library.” Luhrs worked with the center’s director and students to curate the collection. Together they removed dated material, like old college textbooks. Most of the materials have been donated so the collection varies greatly. “We cleaned it up, made some signs, and created a space to read,” Luhrs says. The signs were made with leftover planks of wood. Lafayette students painted the planks with artistic designs and inspirational quotes about women in leadership. While the school is English immersion, Luhrs also began to build a Spanish language collection. One aspect of the trip was to teach a lesson. Lafayette students prepared a seminar about women in leadership. Part of it included a vision-board session to help the women plan their futures. Another part focused on Nobel Prize winner Malala Yousafzai, who was shot in the head by the Taliban for campaigning for girls’ education. Their reach goes far. Graduates of the center have gone on to work as translators, teachers, and community organizers at area nonprofits. More importantly the success and learning are mutual.